Is it the engineering (antique/european/?? ), the styling, the relative rarity, the fact that you could get one out of a catalog and have it delivered to your house? For each of us who have been caught up in this collecting habit, it is one (or maybe all) of these things. Plus, having dozens of people walk up to you at a show and say, "I (or my Dad, or my Grandpa, or my idiot uncle) had one JUST LIKE THAT"
Do you have a bike in mind? Find something you can relate to. If you don't like the bike you pick before you start to restore it, it's unlikely you will like it much better when you're done. A disguised Sears 106SS. Looks like a Gilera. 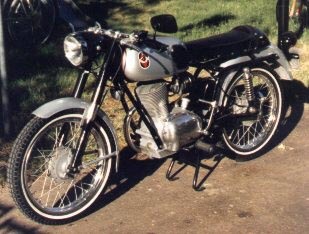 Actually it IS a Gilera, no longer impersonating a Sears. A few custom touches like the polished sidecovers, flat bar, race seat, and WHITEWALLS?? Yep, that's how I did it. A replica of a bike that (almost) carried me reliably through my college days in Boulder, CO. If you find the bike you want, don't stop. Make it an extension of yourself. Have fun with it. Daydream. Tinker. Waste time and money. It is probably the healthiest thing you can do with your time. Don't ask your personal trainer if that is true. In fact, if you have a personal trainer, you probably shouldn't be reading any of this. 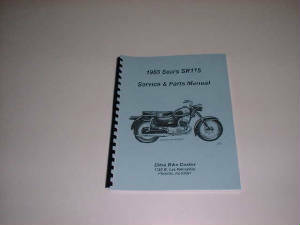 You can get reprinted service/owner's/parts manuals from me. Check the Model #'s Page!